This book bridges the gap between what business leaders understand about their business and what they have yet to learn about this technology. The author introduces the concept of Mission Based Configuration, showing companies how to apply time and labor systems to their business needs to save time and money. The use of technology offers an effective tool to manage budgets, meet strategic targets, and channel decision-making toward best practices. 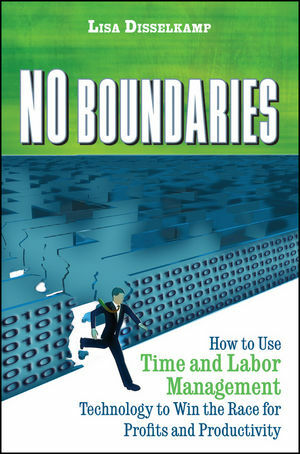 No Boundaries reveals how your business can win the race for profits and productivity. Lisa Disselkamp is a leader and visionary in the workforce technology industry helping employers increase productivity and profits through their strategic use of workforce management technology. She is a business leader, author, consultant, and popular speaker. As President of Athena Enterprises, she leads a team of talented consultants who share her passion and engage her powerful "Mission Based Configuration" and "Manage with Intent" methodologies. She has led multi-million dollar projects impacting up to 70,000 employees in companies with billion dollar payrolls. In 2005, Mrs. Disselkamp was invited by Newt Gingrich to present to the Center for Health Transformation in Washington DC. She has authored the only two books on time and labor systems. In 2008 she was recognized as the "Woman of the Year - Technology Star" by the Smart Woman's Club. PART I THE EMERGENCE OF WORKFORCE MANAGEMENT TECHNOLOGY AND WHAT IT CAN DO FOR YOUR BUSINESS. CHAPTER 1: How I Got Started in Time and Labor Management Technology. An Uncharted Career Path Takes Off. A New Time and Attendance Opportunity Presents Itself. CHAPTER 2: Using Labor Data Technology to Better Run Organizations. What Is the Perfect Setup for Managing Your Business? The Evolution of Business Technology. The Need for WMT Exists in Every Market Sector. CHAPTER 3: Labor Data—A Device Used to Achieve Financial Goals and Maximize Profits. The Power of WMT Will Change Expectations. Use WMT to Manage Budgets Today. WMT Controls Costs and Manages the Complex. Automated Workflow Offers Direct and Indirect Financial Benefits. Is a New Time and Labor Management System Right for Us? CHAPTER 4: Using Workforce Management Technology to Enhance Operations, Quality, and Compliance. Delivering the Right Tools and Data. The Forgotten Areas: Attendance and Leave Management. Compliance Is a Growing Concern. CHAPTER 5: How Automated Systems Make Life Easier. Configurable Software Supports Complex Rules. Historical Edit Features Maintain Accuracy in Any Time Frame. Group Edits Make Life Easy. Error Reporting Is the Sonar of WMT. Calendars Reveal Chronic Tardiness and Absences Easily. Make Tracking Operational Issues Routine. CHAPTER 6: The Human Side of Technical Implementations. You Must Understand Your People. Know How to Change Behavior. CHAPTER 7: The Many Benefits of Workforce Scheduling Technology. The Science of Workforce Scheduling. How a Scheduling System Accomplishes Its Goals. Budget and Schedule in a Dynamic Environment. PART II WORKFORCE MANAGEMENT TECHNOLOGY SYSTEMS AND INSTALLATION CONSIDERATIONS. CHAPTER 8: Adding Value to Data through Collection, Storage, and Distribution Techniques. Data Is for Everyone, Everything, and Everywhere. You Cannot Manage What You Cannot See. CHAPTER 9: System Mission and Communications. What Is the System Here to Do? Sell the Benefits of the New System. PART III FROM CONCEPT TO PROJECT. CHAPTER 10: The Need for a Business Case. The Value of Creating a Business Case. Why This Process Makes Sense. Business Case Development Is a Team Effort. A Good Business Case Is Both a Map and a Contract. Be Thorough—Don’t Be Set Aside. CHAPTER 11: What to Look for and Consider. Focus on Benefits and Consider the Alternatives. Look Out for Hidden Practices. Where Should the Different Types of Data Reside? The System Should Be a Platform. Software as a Service (SaaS)—Hosted Solutions Have a Lot to Offer. CHAPTER 12: Creating a Mission-Based Workforce Management Technology System. The Business Case Defines the Mission. Cost Should Be Related to Value. APPENDIX A: A New Path for Payroll Professionals. The Evolution of Payroll and HR. Why Payroll and Human Resources Have Evolved so Differently. Payroll Should Be Positioned as a Strategic Player. APPENDIX B: Especially for Owners and C-Level Executives.